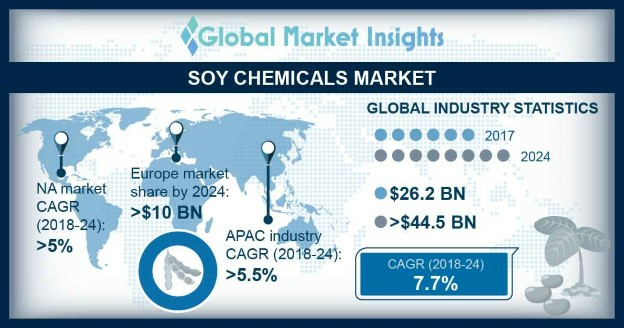 Soy-based Chemicals Market size is set to reach USD 44.5 billion by 2024; according to a new research report by Global Market Insights, Inc. Rising healthcare awareness and changing lifestyle patterns along with shifting consumer preferences towards plant-based sources may stimulate soy-based chemicals market. Soy oil derivatives such as polyols, wax, epoxidized products and methyl soyate are used across various end-use applications which may promote soy chemicals industry demand. Growing demand from animal feed applications owing to rising livestock production and demand for meat and related products may have a positive influence on the market demand. These products are used in maintaining health of various livestock such as poultry, aquaculture, swine and cattle along with providing essential nutrients such as vitamins and minerals. Supportive government initiatives regarding efficient and safe poultry production may foster soy-based chemicals market growth. Refined industrial soybean oil is highly used in applications such as biodiesel, lubricants, paints and amongst other industrial uses. The product is used as an alternative for petroleum based resin which are likely to cause hazardous environmental problems. These products are utilized in the production of automobile parts and other manufacturing applications. Increasing consumer awareness for reduction in carbon emissions along with beneficial usage of soybean products may enhance soy-based chemicals market share. North America GMO soy lecithin market from food & beverage applications may expect gains at over 5% by the end of 2024. The product is used as a food additive such as emulsifiers which are incorporated in various food products such as dietary supplements, baked goods, infant formulas, ice creams and convenience foods. It is highly used for cholesterol maintenance and boost brain functions. These products are generally sold in supplement forms which are widely accepted for promoting overall health and wellness of individuals. Additionally, increasing obesity concerns in the U.S. along with rising health diseases is propagating consumers to shift towards healthy plant-based sources which may further boost soy-based chemical market size. Soybean oil and soy flour are mainly used as raw materials in the manufacturing of these products. Rising demand for food & beverage applications pertaining to high content of healthy polyunsaturated fats, omega-3 fatty acids, vitamins and minerals along with providing health benefits such as reduced risks of osteoporosis and cognitive disorders may influence soy-based chemicals market revenue. China tocopherols market size from cosmetics applications may surpass USD 7 million by the end of forecast period. The products are highly in the personal care products such as moisturizers, lipstick, blushers, hair conditioners, eye shadow, soaps and face powders. Vitamin E is a naturally occurring antioxidant which prevents skin from harmful exposure of UV rays and is used as preservative for hydrating skin which may further boost soy-based chemicals market demand. Germany epoxidized soybean oil market demand from plasticizer applications may witness market share at over 50% by the end of projected timeline. The product is highly manufactured from soybean oil following epoxidized process. Plasticizers from soybean oil are environment friendly and provides cost benefits which may enhance soy chemical market size in the country. ADM, Cargill, Soy Technologies, Bunge, Stepan BioBased Technologies, Elevance Renewable Sciences and Cara Plastics are some of the prominent manufacturers in the soy-based chemicals market. Major producers in the market are expanding their regional presence and enhancing product portfolio by strategic mergers and acquisitions.